Many of the consumer and business sentiment surveys continue to be reported at or near record levels. I highlighted a few of these high level optimism surveys last month in a post titled, Sentiment Is Widely Positive. 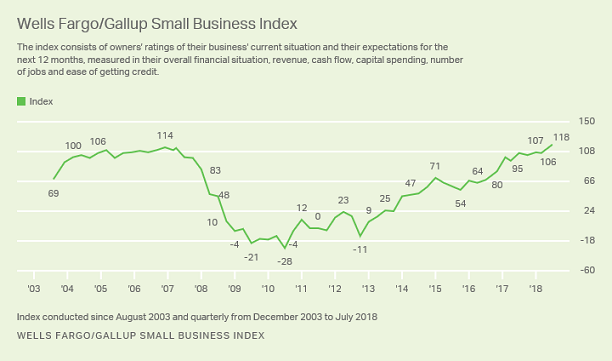 Earlier this week Gallup released the results of the quarterly Wells Fargo/Gallup Small Business Index and Gallup noted, "small business owners are more optimistic than at any point in the 15-year history of the Index." The index level high of 118 surpasses the prior high of 114 reached in 2006. The interviews for the survey were conducted in mid July so it does account for any issues surrounding trade and tariffs. If record high optimism is any indication, business sentiment around the trade issues seems much less worrisome at the moment than the headlines from news commentary may be suggesting. "The Wells Fargo/Gallup Small Business Index includes an open-ended question asking small-business owners to name the most important challenge facing their businesses. In the current update, owners remain more likely to say that hiring poses a greater challenge than any other single issue, with 18% citing this as their top concern. Hiring is the only issue cited by at least 10% of owners."